Rhode Island has not adopted or made available a definition of college and career readiness. Rhode Island state policy allows students to earn dual credit for academic or CTE postsecondary courses taken at postsecondary institutions or virtually. It is unclear whether public postsecondary institutions in the state are required to accept dual-enrollment credits (ECS, 2015). Rhode Island is not participating in the Early College High School Initiative (ECHSI). More information about schools participating in ECHSI is available at the ECHSI website (Jobs for the Future, n.d.). Rhode Island uses the 16 Career Clusters for state and federal reporting but does not use them to guide or organize state CTE programs. 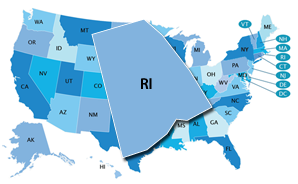 Rhode Island maintains programs of study in all 16 Career Clusters. In Rhode Island, the Individual Learning Plan (ILP) is a student-directed planning and monitoring tool that customizes learning opportunities throughout students’ secondary school experience, broadens their perspectives, and supports attainment of goals. The ILP documents students' interests, needs, supports, course selections (including access to college-level programming), transition placements, and other learning experiences, both in and out of school. Rhode Island's ILP is mandated by the state. It includes all students in Grades 6–12. Students must demonstrate proficiency using two of the following four performance-based diploma assessments: exhibitions, comprehensive course assessments, graduation portfolios, and certificates of initial mastery. Rhode Island’s state-specific Early Warning System is called the Rhode Island Diploma System. Early Warning System data are reported at the student level to district personnel, school administrators, and teachers.